As a leading sales outsourcing firm, one of the biggest challenges we face each day is hiring sales reps. Because each of our clients’ brands possess their own unique value story, we need to know which candidate will not only be self-motivated or a hard worker, but which candidate will be able to sell that specific value story. In fact, proper recruiting is so integral to our operations that we’ve built our own proprietary hiring methodology across the past 20 years, learning from our wins . . . and of course our losses. On top of that, we have a dedicated in-house team of seasoned recruiters that hire hundreds of sales reps each year using this exact methodology. In this article we will review the current sales hiring landscape, look at some industry statistics, and explore how building a good recruiting process (methodology) can help alleviate some of the roadblocks (and lost revenue) you may run into while trying to hire the right sales rep. The average annual turnover in sales is 25% – 35% (that’s the equivalent of an average sales organization being hired and trained every 4 years or so). Direct replacement costs for a telesales employee can range from $75,000-$90,000, while other sales positions can cost a company as much as $300,000 (not to mention the lost sales while the new hiree is being recruited). There is no easily identified hiring pool for sales positions (according to the article, 50% of U.S. college grads are likely to work in sales regardless of their major). The U.S. boasts a whopping 4,000+ colleges (but less than 100 of them have a sales program or even course). So what’s this really telling us? Hiring salespeople is hard. There’s no readily-made talent pool to pull candidates from, and when you do, there’s approximately a 30% chance they will be working somewhere else by the end of the year. In effect, most companies tend to spend more time and money on hiring in sales than anywhere else. First, get a detailed concept of who you are hiring for. Each company is different, and your hiring methodology will need to be flexible based on who the rep will be selling for. A younger SaaS startup will be looking for a drastically different salesperson than a young biotechnology startup. Even if the company you are hiring for is in a very specific niche, each brand has some unique qualities that establish them from their competition. Hone in on the details of the company, and you’ll narrow down your search before you start. Next, take some notes from existing customers. If you are hiring sales reps, but haven’t asked your current customers how they’d want to be sold to, you should update your process. In our 20 years of hiring, we’ve seen sales teams that are putting in the hours, have the charisma, and use a distinct selling process, but are still stuck in a rut struggling to find new customers. Oftentimes we find that the points the salespeople are pitching are outdated, and the consumer is getting tired of hearing the same old routine. Once you have a better idea of what the customers want solutions for, and how your products/services provide them those solutions, you can establish the job’s sales goals. Write a detailed job description of what the candidate should expect from the role. Don’t use general terms, and make it as specific as you can. Include what you expect from the candidate’s previous experience, qualifications, and day-to-day activities. Once you’ve got that taken care of, you can figure out the appropriate compensation for the job. Don’t get caught up on degrees. As we went over earlier, less than 100 colleges in the U.S. have sales programs. Sure, a degree shows the candidate has some drive and grit to stick with something, but hiring sales reps is highly variable. Degrees don’t make good salespeople, but they don’t hurt either. Sticking to a scoring system can really help out here. Use a scoring system, but don’t hold it as gospel. Our proprietary hiring methodology uses a scoring system, but the candidates’ scores, aren’t necessarily what determine them getting hired or not. A scoring system helps you keep track of how the interviewee is answering your pre-written questions, and how they may fit in with the company you are hiring sales reps for. You can range your scores based on a 1-10 system, or get more complex if you want more detail. You can use each candidate’s score as a base to work off of, but hiring the right people the right way relies on you, the recruiter. Finally, try to avoid cliche interview roleplaying. Making the hiree try to sell you on a product or service during the interview doesn’t give you a whole lot to go on, and usually leaves them feeling insecure about trying to sell a product they don’t necessarily know as well as they need to. 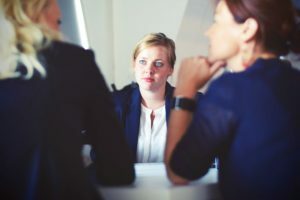 Even if the sales position requires on-the-spot selling, a salesperson’s pitch can change tenfold with a little knowledge of how the product or service helps the people they will be pitching to. Are you recruiting the right way? Odds are, there will be some parts of the hiring process you can improve, or start implementing. Recruiters tend to talk about how there is no real way to hire the right salesperson, that this group of people varies too widely, but sticking to a hiring methodology has shown us that there are some hacks to the paradigm. If you are in the process of looking for new sales reps, stop relying on the candidates’ charisma, like-ability, or status. Sometimes you’ll find a gem in the rough, but a lot of the time the interviewees that score well do so for a reason. Build your methodology, and stick to it. Looking to learn more about how Sales Partnerships helps companies deliver better sales results? With sales reps in more than 100 major cities across North America, and several engagement selling teams international markets, we can help. Contact us today and let us show you how!